The Paris Process on Mobility and Climate, an inclusive and open partnership joined by WRI Ross Center for Sustainable Cities is highlighting how we are all participants and dependents of our transport choices. 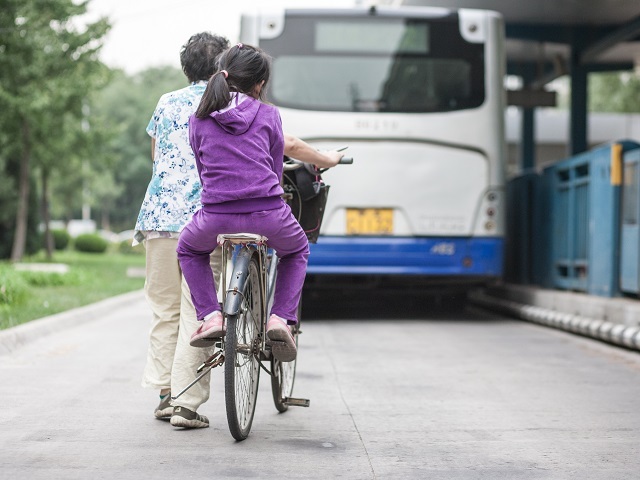 This blog looks at the link between the choice for equitable and low-carbon transport. Read more about #WeAreTransport on TheCityFix. By the year 2030, one billion more people will need to access transport; of these individuals, 870 million will be located in Asia and Africa. Troublingly, greenhouse gas (GHG) emissions from transport—under a business-as-usual scenario—are projected to rise from 23 percent to 33 percent by 2050, according to the International Transport Forum. But to both these problems, there is one solution: sustainable transport, when implemented in ways that are socially, economically and environmentally positive, is at the nexus of better accessibility for people and a decreased carbon footprint. The transport sector has historically been plagued by inequitable forms of growth. For example, the widespread construction of new roads largely benefits high-income consumers affluent enough to purchase, maintain and insure cars. In that sense, investment in car-oriented transport can foster inequality and divert funds away from more sustainable forms of mobility, like metro, cable cars or bus rapid transit (BRT) networks. Car-centric development also has huge implications for public health. More than 1.2 million people die in traffic crashes every year—which is more than 3,200 people per day. According to the World Health Organization’s (WHO) 2015 Global status report on road safety, the majority of those fatalities occur in developing countries. Children are also especially vulnerable: According to a 2008 World Health Organization (WHO) report, 21 percent of global traffic-related fatalities were among children under the age of 18, and traffic injuries were one of the leading causes of death for people under 20 years old. Furthermore, the 50 million annual injuries and disabilities caused by crashes add steep, long-term social costs, which often force many families into poverty. Plus, needing to travel by car can reduce physical activity and increase sedentary time, leading to cardiovascular disease and obesity. 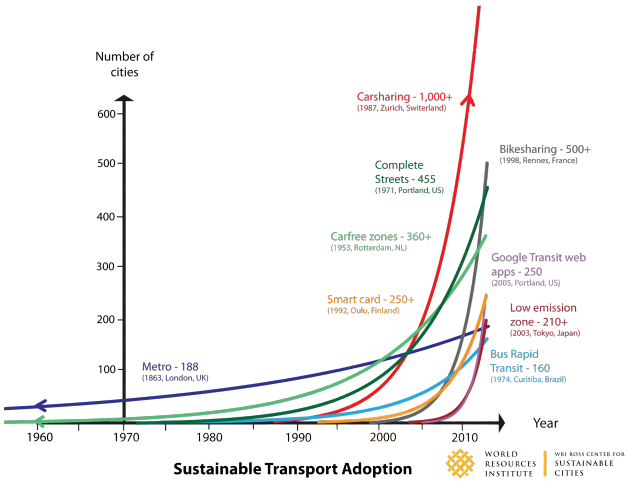 Figure: Innovation in Sustainable Transport – Adoption Curves. Research by Heshuang Zheng, Dario Hidalgo and Akshay Mani; Design by Benoit Colin and Heshuang Zheng. About half of all fatalities from traffic crashes occur in urban areas, which also account for up to 70 percent of global GHG emissions. Designing for cyclists and pedestrians, instead of cars, can reap benefits in areas of climate, human health and mobility. In its new research, Cities Safer by Design, WRI Ross Center for Sustainable Cities provides a guide to better city infrastructure that makes cities safer while also creating a better environment for life, work and business. Consider in Sao Paulo, where more than 1,300 people lose their lives in traffic crashes per year. Yet after officials invested heavily in building hundreds of kilometers of bus rapid transit (BRT) and cycling lanes over the last few years, pedestrian facilities dropped by 18.5 percent. Bus Rapid Transit has also proven to reduce traffic fatalities in Mexico City, as well as benefitting some of the lower income classes of the population. In addition to creating more equitable and livable cities, these systems curb climate change. Bogotá’s Bus Rapid Transit (BRT) is estimated to save 1 million tons of CO2 equivalent per year. The total of 11 BRTs that registered their emissions reductions with the United Nations forecast a reduction by 31.4 million tonnes of CO2e, an amount equivalent to the annual GHG emissions from more than 6.5 million passenger cars (Social, Environmental and Economic Impacts of Bus Rapid Transit). Encouragingly, more and more cities are pursuing these forms of low-carbon transport. With smart card technology, bike share schemes have been revolutionized, with more than 5,000 bike sharing systems now in place globally – including well-used networks in Paris, Lyon, New York, Mexico City and Beijing. For example, Hangzhou, China has more than 2,400 stations and more than 60,600 shared bikes. Bus Rapid Transit has also expanded beyond its Latin American birthplace to now 198 cities, and over 32.8 million passengers per day. To place us on a different track than our current outdated model of car-oriented growth, we need transformative change. Low-carbon mobility is an economically and socially responsible way to go about tackling climate change, while improving livelihoods for all sectors of society. Cities today have a choice–a future of car-filled, polluted, and dangerous streets, or a healthy, safe environment for their citizens. But these decisions about the future need to be made today. It’s time for all cities to start seeing sustainable transport as a win-win solution.